Open during regular library hours. Call 917-275-6975, or check library website. My first experience seeing Flamenco was at the 1964 New York World's Fair in Flushing Meadows. I have no recollection of the show itself. But I have never forgotten the immense feelings of joy and awe that it evoked, nor the performer's name—Antonio Gades. Since then, I have gone to scores of Flamenco shows, of dance, guitar and cante (song) in big venues and in small tablaos, both in New York and in Spain. However, little did I realize how much the two places were inextricably linked until I was taken on a tour by New York-based K. Meira Goldberg, the co-curator of the spectacular, comprehensive "100 Years of Flamenco in New York," on view at the New York Public Library for the Performing Arts until August 3. The other co-curator, dance historian Ninotchka Bennahum, teaches at the University of California, Santa Barbara. The one room is jam-packed with photographs lining all four walls, mostly in a timeline, supplemented with captions describing personages and historical context. But, said Goldberg, even those extensive captions were insufficient for all the research they compiled, so a book with expanded captions is available on a table at the entranceway. There is also a 14-page booklet and a bilingual four-pager, both excellent reference guides to the exhibit, to take home. For those who crave even more, "100 Years of Flamenco in NYC," a 180-page catalogue, is for sale for $60. There are four screens of film and videos, plus a slideshow of local performers (no list of names available), "because we couldn't fit everyone on a wall," said Goldberg. Display cases abound with books, LP's, flyers, playbills, ads, shoes and peiñatas (combs). Of special interest are two finely crafted embroidered jackets; one belonged to Italian-born, Brooklyn-raised José Greco, and the other was from Ted Shawn, an early modern dance pioneer, who choreographed several Flamenco-infused works. In a large case is a fiery red bata de cola (long-trained ruffled dress) and voluminous embroidered floral mantón (fringed shawl) worn by María Alba (1910-1999). There is also a soundtrack of guitar and song (list available) emoting from an overhead speaker, which nicely rounds out the multi-media experience. "Every picture has a story," said Goldberg, who is not only an erudite Flamenco scholar but also an accomplished Flamenco dancer—she danced in tablaos in Madrid and with Carlota Santana and Fred Darsow (contemporary Flamenco fusion) in New York. The left wall heralds the early years of Flamenco in NYC and Spain—how they mirrored and influenced each other beginning in the 1830s and 1840s. American cities saw a steady influx of Spanish dancers in respectable theaters, concert saloons, beer halls, pleasure gardens and the like, while Spain established Café Cantantes. Entertainment in both consisted of the two pillars of Spanish dance: Escuela Bolera, or Bolero School (classical Spanish), popular dances derived from Spanish ballet toward the end of the 18th century, and Flamenco, which referred to gypsy performers as well as to a style of gypsy dancing. A black and white lithograph from 1875 depicts the four-story, 1,450-seat Chickering Hall, on the northwest corner of 18th Street and Fifth Avenue in the then entertainment district around Union Square, where Carmencita (Carmen Dauset Moreno), "the Pearl of Seville," performed. Her sister-in-law was the first Flamenco singer to perform in New York in 1892. "Carmencita," a black-and-white silent, which runs less than a minute, was produced by Thomas Edison in his Black Maria Studio with a Vitascope projector in 1894. It is the oldest film of Spanish dance in America, and Carmencita may be the first woman to appear in a motion picture in the U.S. Goldberg pointed out that Carmencita was classical Spanish School by the way she used her skirt with her hand, as opposed to Juana la Macarrona (Juana Vargas), a gypsy and early Flamenco dancer—what we would recognize as Flamenco—who moved her skirt with her foot, as shown in a rare 1918 film, made in Spain by Leonide Massine, the Russian dancer and choreographer. Carmen Amaya (1913-1963), who grew up tough in the slums of Barcelona, became the greatest Spanish gypsy dancer of her generation. There are photographs and films of her mesmerizing performances. Sol Hurok, the impresario, billed her as "The Human Vesuvius" in a 1942 color poster draping down one wall. "Amaya was very significant," said Goldberg. 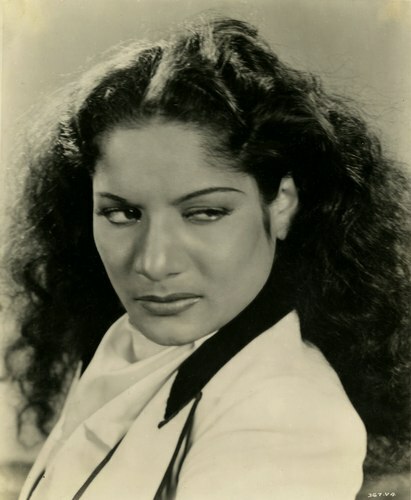 "She was the first gypsy to become known on the international stage. Before her, everyone was imitating gypsies. She brought in real compass [rhythm]. She was fluent in rhythm." Goldberg continued, "She worked in both positive and negative and created a fierce persona, which was both frightening and seductive. Everything in our movement, the tension we hold in our body intentionally comes from her." But gypsy Flamenco also incorporated African-American dance elements from the Cakewalk, the Charleston and tap at the beginning of the 20th century in its use of the feet, inwardly turned knees, "jazz hands" and forward pelvic thrust. "Everything now is jazz," said La Argentina (Antonia Mercé, 1890-1936)) in a souvenir program. 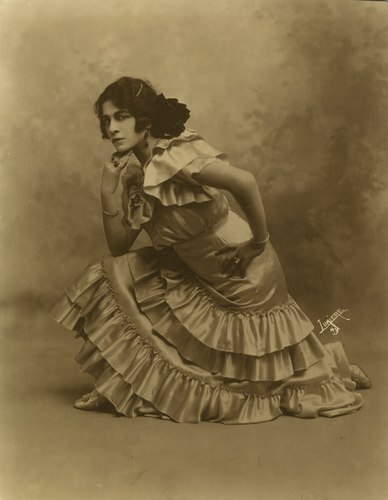 While Spanish immigrants danced their way through our shores, Americans and Europeans flocked to Spain to watch performances, study the dance form and bring it back home, some under new names, like Carola Goya (born Caroll Weller), one of many homegrown stars of the 1920's. Joan Fitzmaurice, a young Irish-American modern dancer, transformed into the legendary María Alba. When she joined Roberto Ximénez's company, he prohibited her from speaking so no one would know she wasn't Spanish. Thanks to La Argentinita (Encarnación López Júlvez) bailaores (male Flamenco dancers) came into their own. In her heyday of the 1930s and 1940s, she was famous for her steamy male partnerships, related Goldberg, which included Greco, Antonio Triana and Federico Rey. After her death at 47, her sister Pilar López, ran the company and catapulted nearly every major bailaor to fame in the last century. Another milestone in Flamenco arose from the Spanish Civil War (1936 to 1939). Many refugees escaping the fascist dictatorship of Francisco Franco made New York their home, where they performed, opened up dance schools and formed a community. "I thought a lot about this complicated relationship between Flamenco and Franco's dictatorship," admitted Goldberg. "He had his agents watch what was being sung. 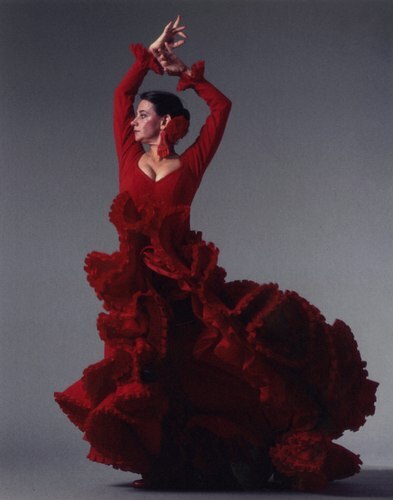 But he liked Flamenco and understood it was important to promote it to help rebuild the economy." España es diferente was the slogan. Superstar Gades, a fervent communist, was given a pass; he received a medal of tourist merit from Franco. The last wall is a Who's Who of contemporary Flamenco artists, two of whom seemed to step out of their photographs and materialize on the day of my interview with Goldberg: Sara Erde, a specialist in gypsy-style Flamenco, who is also a soloist and corps dancer with the New York City Metropolitan Opera; and Iranian (Sephardic)-American Leilah Broukhim, who is based in Spain. They all greeted each other like long-lost friends. After the interview, I immersed myself in films at one station. Highlights: the steamy Amaya with Sabicas on guitar; Greco in an interview and dancing a Bolero; Pilar López from 1975; and an excerpt from the 1948 "The Loves of Carmen," starring Rita Hayworth (Brooklyn-born Margarita Carmen Cansino), in which she dances a very decent Flamenco—watch those incredible vueltas quebradas (deep turns) she executes. Her dance partner is her uncle, José Cansino. "This is the most important event to happen to Flamenco ever—what an honor for the art form," said Santana in a press release. "We finally made it in the mainstream." Thursday, June 6, 6 p.m., a screening of the documentary, "The Fabulous Sabicas" (2012), directed by Pablo Calatayud. 82 minutes. In Spanish with English subtitles. In the Library's Bruno Walter Auditorium. Photo courtesy of Flamenco Vivo. Carmen Amaya and the Gypsy Gaze. 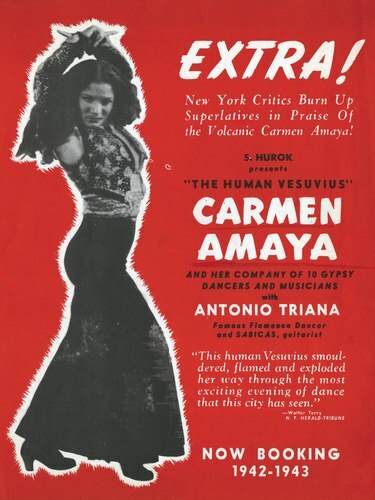 Poster of Carmen Amaya as "Human Vesuvius," 1942. Photo courtesy of Carlota Merce de Pavloff.